Sweeping beaches, towering hilltops, and picturesque vineyards adorn the landscape of Cape Town, dominated by the imposing Table Mountain. Kick off your visit on the 16th (Thu): enjoy the sand and surf at Boulders Beach. Keep things going the next day: take your sightseeing to a higher altitude at Table Mountain National Park, then take in the dramatic natural features at Twelve Apostles, and then enjoy the sand and surf at Clifton Beaches. To see other places to visit, ratings, photos, and other tourist information, use the Cape Town itinerary builder. Durban to Cape Town is an approximately 5-hour flight. You can also drive; or take a bus. Expect slightly colder evenings in Cape Town when traveling from Durban in November, with lows around 16°C. Cap off your sightseeing on the 18th (Sat) early enough to go by car to Hermanus. 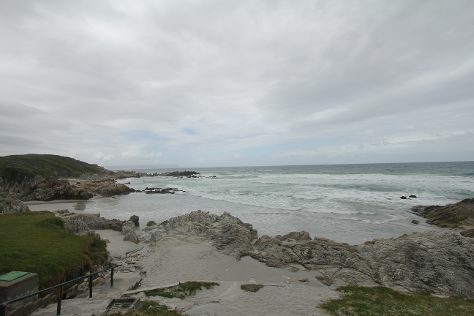 Renowned as a premier whale-watching destination, Hermanus grew from a quaint fishing village nestled on Walker Bay. On the 18th (Sat), stroll through Kwaaiwater, look for gifts at The Book Collector, then stop by Funky Vibes, and finally enjoy the sand and surf at Grotto Beach. To see reviews, more things to do, ratings, and more tourist information, use the Hermanus trip generator. You can drive from Cape Town to Hermanus in 1.5 hours. Another option is to do a combination of bus and taxi. In November, plan for daily highs up to 27°C, and evening lows to 15°C. Cap off your sightseeing on the 19th (Sun) early enough to travel to Plettenberg Bay. As one of South Africa's most popular beach destinations, the resort town of Plettenberg Bay comes to life in December and January, when the holiday homes fill up with domestic tourists and foreigner visitors. Kick off your visit on the 19th (Sun): stroll through Monkeyland Primate Sanctuary, then tour the pleasant surroundings at Tenikwa Wildlife Awareness Centre, and then explore the wealth of natural beauty at Garden Route (Tsitsikamma, Knysna, Wilderness) National Park. Here are some ideas for day two: stroll through Featherbed Nature Reserve, look for gifts at Metelerkamps, and then indulge your taste buds at Elephant Walk Farm Stall. To find traveler tips, photos, ratings, and more tourist information, read our Plettenberg Bay holiday planner. Getting from Hermanus to Plettenberg Bay by combination of taxi and flight takes about 3 hours. Other options: drive; or do a combination of taxi and bus. In November, daytime highs in Plettenberg Bay are 24°C, while nighttime lows are 16°C. Finish up your sightseeing early on the 20th (Mon) so you can travel back home.